When shall we Trick or Treat the cult? roarsauce wrote: By the way my luck is going I'm not sure if I will be able to go. My mother isn't "against" the idea but my father is. His whole aspect is that protesting is an idiotic waste of time, so any ideas on how I can convinced him otherwise? Depending on his age, you might remind him that it was peaceful (mostly) protests that got: the Civil Rights Act passed; women the right to vote; 18 year olds the right to vote; an end to the Vietnam war. Should I continue? Good news, I had a conversation with him and it didn't include insults or I walking to my room in a fit of anger! I believe I am winning. Roar I admire your tenacity in expressing yourself to your parents. I wish mine had more of a social conscious, I'd welcome them to protest with me. I cannot think what might work to get your father to pay attention...I cannot imagine not listening to my kids and also cannot imagine discouraging them from protesting something that is important to them. So good luck! Ken, welcome. It seems like your luck has helped me, and it appears that I will 100% be going. 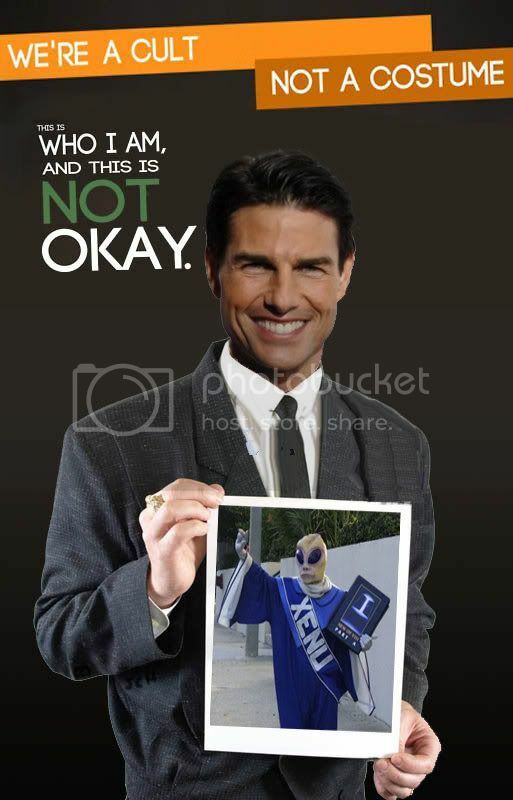 With the "We're a culture, not a costume" poster campaign going on here in Ohio people have been making parodies. While browsing some of them and loling I saw this and I was happy. roarsauce wrote: It seems like your luck has helped me, and it appears that I will 100% be going. Cool. Am I meeting you at the Marathon station or will you have a ride? I would be taken by the parents, or parent. They will more then likely want to stay just to make sure I don't get hurt or anything so I've come up with a small plan to make sure the scilons don't think they are affiliated. see you all! rock the scilons! That feeling of betrayal has hit me pretty hard just now. My dad spent the better part of the day trying to bribe me with large flat screens and bluray players to get out of going, but I refused those. And now he told me that we weren't going at all, the excuse being its to far and its a waste of time. It's obvious that next time I should just do the car pool instead of trying to win over my dad. So please take a thousand pictures for me if you can. 12 now, and he said to let him know before 9 if I had to change my plans. Sadly I will have to wait, but now they owe me severely, especially telling me that I can go and then wait hours before saying no.